This dish doesn't have a recipe that I'm linking to since we threw it together on Friday night, and uh, I'm slightly embarrassed to admit that it was inspired by a Buca di Beppo dish. As I've mentioned before, I subscribe to at least 20 restaurant e-mail clubs for work purposes. 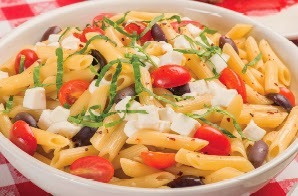 Buca di Beppo, in general, doesn't have the best food photography and I'm not a fan of their restaurant at all (their food is so bland); however, their Penne alla Caprese actually looked pretty good and fresh when I saw their e-mail come through on Friday! We created a dish for dinner with the same components, and it turned out great. Sauteed some garlic and red pepper in olive oil and then added halved grape tomatoes. Added cooked pasta to the pan. 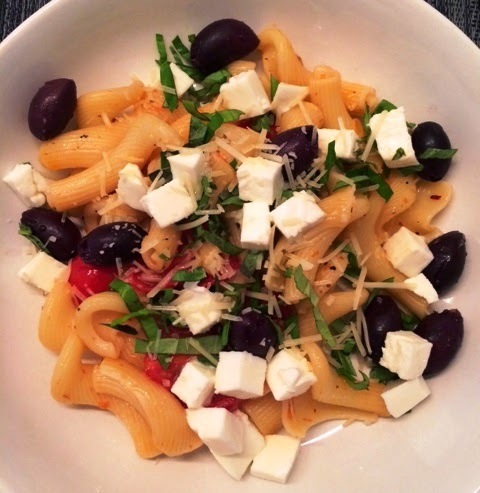 Served it in a shallow bowl, topping it with diced fresh mozzarella, basil, black olives, fresh Parmesan, a drizzle of extra-virgin olive oil and a sprinkle of Maldon sea salt.